My 7-year-old daughter, Vanessa, loves it when I tell her we’re going to do a craft together. Although I’m never sure if I’m doing things right, just quality spending time with her and my younger son trying to make something beautiful and unique with our own hands is enough to make me love it too! Since we’ll be spending Nochebuena at my sister’s house this year and she’s asked all of us to bring an ornament for her Christmas tree, we decided that we would make them, making sure we somehow incorporated the Spanish language. After trying to come up with something totally different, I remembered I had once seen an ornament made with the wooden tiles of Scrabble, one of my favorite board games. Believe or not, I have a really old one that I’ve kept for many years even though it’s missing many of the letters. I know I could’ve just ordered the ones missing, but I never got around to it and since we wanted to make some original ornaments, I figured the time had come to put the tiles to good use. 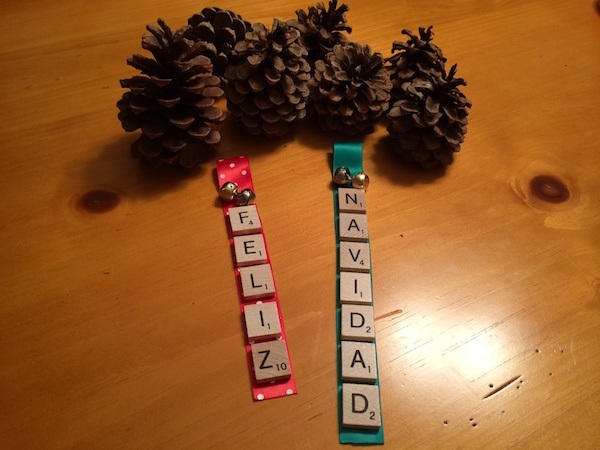 So we decided to make ornaments with words in Spanish that represent the holidays for us using Scrabble letters. If you don’t have a set of Scrabble, you can get one for less than $20 at Walmart. While it may feel weird to get a board game just for a craft, think about the compliments you’ll get on your unique ornaments. 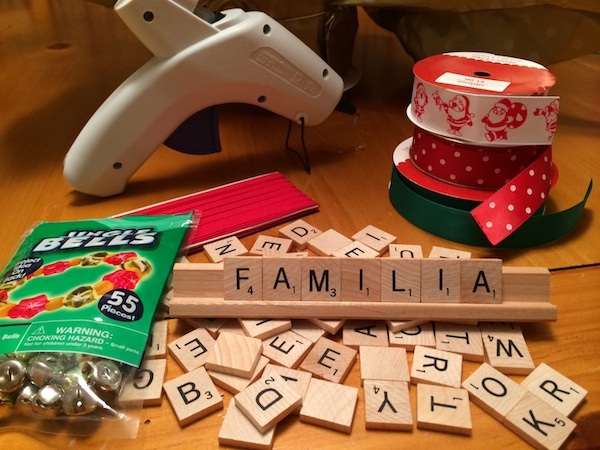 Other than the actual wooden tiles, you’ll need some Christmas-themed ribbon, a gun glue and any other trinkets you may want to include and you can find all of it in the crafts section of your local Walmart. We got some jingle bells and we ended up doing two different types of ornaments. One with the words spelled out horizontally using colorful foam sheets as the backing and one with the words spelled out vertically using ribbon as the backing. 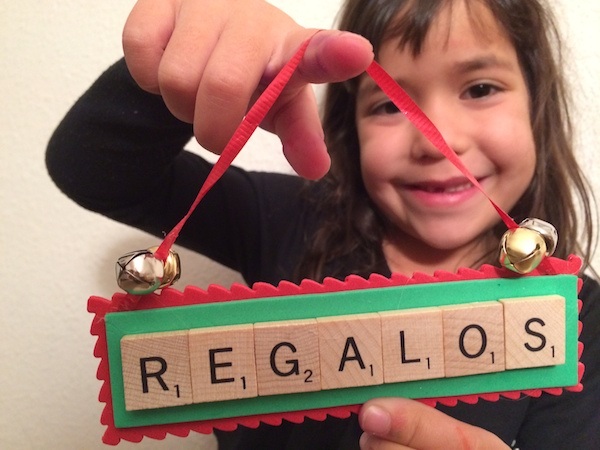 The first thing we did was come up with a list of words in Spanish that we associate with the holiday season. Then, we grabbed the ribbon of our choice and we laid down each letter attaching it to the ribbon with a bit of glue. We left a bit of space between each tile because we wanted the polka dots to come through, but you don’t have to. We also left extra ribbon on top to make a loop to hang the ornament. 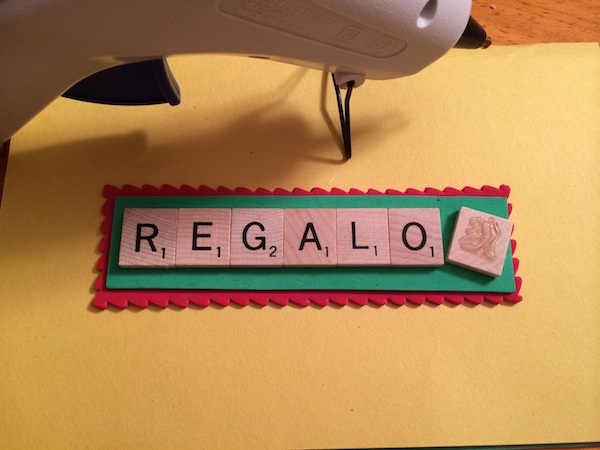 My favorite part of this craft is that the options are endless and the kids get to practice their spelling in Spanish! Thank you for sharing this information with us. You inspired me to do the same this year. Unfortunately I work during Christmas at https://nz-casinos.com/ and wont be able to spend this magical evening with my family. However, I will try to have pre-Cristmas celebration and play creative board games with my kids.